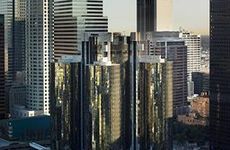 Find The Westin Bonaventure Hotel and Suites, Los Angeles deals, discounts and special offers. Enjoy fine accommodations, top quality amenities, and superior customer service right at the beach. This hotel with 573 guestrooms offers a fitness center, an airport shuttle, and complimentary wireless. Specializing in weekly stays, this B&B is located just below the Hollywood Sign and is within walking distance to parks. This B&B is a restored estate with furnished rooms that include cable T.V., HBO, and Wi-Fi internet. This hotel has 116 guest rooms, each with a kitchenette and high-speed internet. This pet friendly hotel features a heated outdoor pool and poolside bar and free internet access. Located on Wilshire Boulevard, in the heart of Rodeo Drive, this hotel has a cafe, swimming pool, and conference center. Located near many Los Angeles attractions, this smoke free hotel offers a complimentary deluxe continental breakfast. Located in the top three floors of the Los Angeles Athletic Club, this 72 room hotel features complimentary breakfast. Convenient hotel near LAX and close to Manhattan Beach Pier, with 24-hour complimentary airport shuttle service. This hotel features the Tulips Garden restaurant which overlooks the swimming pool and patio. Located just two blocks from Wilshire Boulevard, this hotel features contemporary design with dark hardwood floors. AAA 3-Diamond hotel located in the heart of historic Chinatown and close to attractions with onsite salon and cafe.